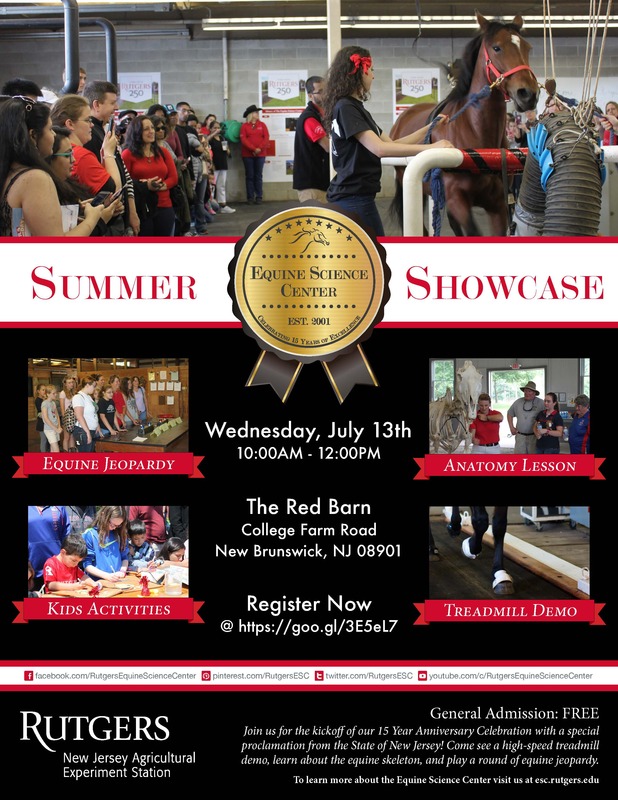 NEW BRUNSWICK, N.J. – The Equine Science Center at Rutgers University is hosting its annual “Summer Showcase” from 10 a.m. to noon on Wednesday, July 13 at the Equine Exercise Physiology Laboratory on College Farm Road, George H. Cook Campus, New Brunswick. The Summer Showcase, similar to an open house, is a FREE event that is open to the public and perfect for any and all equine enthusiasts, ages 8 and up. Dr. Karyn Malinowski, director of the Equine Science Center, will welcome guests and explain why horses are an excellent animal model to study, the type of research being conducted at the Center and its application to human medicine. The Center will be presented with a congressional certificate from U.S. Rep. Donald Norcross (NJ-01) and a special proclamation from the Governor’s office, sponsored by N.J. Senator Bob Smith and N.J. Assemblymen Joseph Egan and Joseph Danielsen to celebrate its “15 Years of Excellence.” The Summer Showcase will serve as a kickoff for a year of events to mark the Center’s 15-year anniversary. Guests will also have an opportunity to experience the thrilling demonstration of a horse galloping at full speed on the 21-foot equine treadmill. Always a crowd favorite, the demo is sure to get one’s adrenaline pumping and heart racing! After the treadmill demonstration, guests will learn all about equine anatomy with RU Wish Bone, the life-sized horse skeleton. The Showcase will also include a round of equine jeopardy and other exciting activities. There is no charge for the Summer Showcase; however, guests must register in advance at https://goo.gl/3E5eL7 . For additional information, contact Kyle Hartmann at esc@aesop.rutgers.edu or 848-932-9419. VIDEO – Here’s a sneak peak of Snowdrift performing on the treadmill at an event in the Red Barn: https://goo.gl/JWvGv0 . The Equine Science Center is a unit of the New Jersey Agricultural Experiment Station at Rutgers, The State University of New Jersey. Its mission is “Better Horse Care through Research and Education” in order to advance the well-being and performance of horses and the equine industry. Its vision is to be recognized throughout New Jersey as well as nationally and internationally for its achievements in identifying issues in the horse industry, finding solutions through science-based inquiry, providing answers to the horse industry and to horse owners, and influencing public policy to ensure the viability of the horse industry.